Blog - Why do we eagerly pretend with our children? What a treat I had this Mother's Day with a trip to the Spa for a relaxing massage. Of course, the 'Spa' was my front room and there was no relaxing music or incense burning, but my youngest was taking it very seriously and I did get a glass of fizz when it was over - I've paid a lot of money in the past for treatments that weren't that much better! It got me thinking about how naturally we as parents play along with the pretend worlds our children create. You know, the 'cakes' they bring us from the sandpit, the cardboard boxes they fly to the moon in, or the tea parties we get invited to along with every cuddly toy in the toy box. We're eager to play along because we want to hold on to the magic of childhood for as long as possible, and we're all too aware of how quickly these precious years will pass. And so I won't forget my day at the spa in a hurry, not only because there will soon come a day when inviting me into his inner world is the last thing Lawrie will want to do, but also because this Mother's Day we had a little bit of time alone - just us. It can be difficult to carve out one-on-one time with our children. 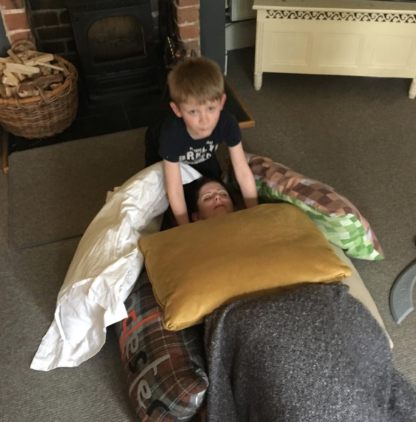 Those of you who already attend Pyjama Drama sessions hopefully feel that our classes are a chance for you to do just that - have a little one-to-one time with them where you both experience the magic of their inner world - the one where they pretend and play with abandon. So, another Mother's Day has come and gone. I hope you all had a lovely day and managed to have your own little piece of magic!